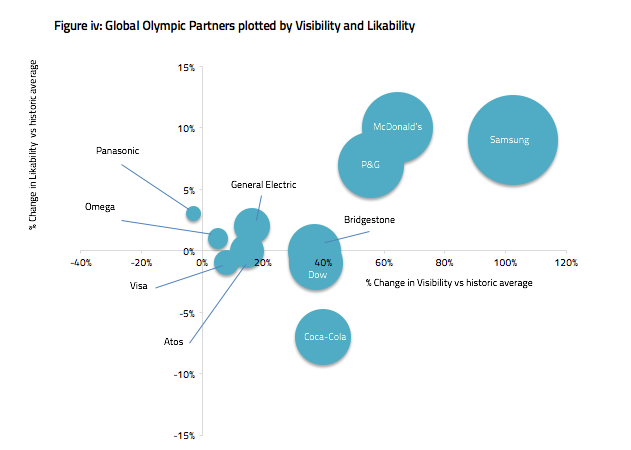 Samsung is the global Olympics sponsor that had the most effective activities around Rio 2016 - although sponsors often struggled to convert the extra exposure into more favourable sentiment, new research suggests. It comes as a number of global sponsors (or "worldwide Olympic partners") speak to PRWeek about which of their activities had the greatest impact – with key trends including the growing importance of sharing content and experiences. Business analytics firm Alva compared public reaction to content from the 11 global Olympics partners in the 12 months before the Games with their reaction during it. It examined changes in: visibility (level of the influence of the audience and the prominence and uniqueness of the brand’s mention); likeability (use of positive words and phrases); and advocacy (use of words or phrases that actively endorse a brand). The research was global but looked at English language content only. Samsung took Gold, having topped the visibility ranking – visibility grew 103 per cent, against an average of +34 per cent for the 11 partners - and was also second in likeability (+9 per cent). The electronics firm’s activities centered on the School of Rio videos featuring comedian Jack Whitehall in the UK, along with the Anthem video, which merged all the national anthems into one. Russell Taylor, CMO of Samsung Electronics UK, says: "The School of Rio social media content has been very well received and delivered content which was relevant, timely and amusing when fans were tuned in to the Games." Samsung also used virtual reality as a focus, providing 'behind the scenes' access to its ambassadors, including former Olympians Sir Steve Redgrave for both media and fans. The Silver medal went to McDonald’s, whose likeability rating grew 10 per cent (although its starting metric was negative). McDonald’s was also second in terms of visibility (+64 per cent), with people sharing pictures of the long queues in the Olympics village, and athletes posting about free meals. Another partner, GE, saw its visibility grow 16 per cent during the Games, while its likeability rating increased two per cent. The company was involved in 187 infrastructure projects at Rio, providing power, lighting, healthcare and other services. GE also sponsored Brazil’s Canoe/Kayak Federation and worked with them to provide real-time data to improve performances. A media tour of the projects, involving journalists from 15 countries, was held in June. "Today we’ve had over 350 earned media pieces around the world that have come through our storytelling," says Christopher Katsuleres, GE director of Olympics and sport programmes. GE also launched a web series starring popular TV characters Tibio and Peronio (pictured below) based in the GE Research Centre in Rio, and shared it on social media. "It really caught fire, you can see an emotional connection with people and these characters," says Katsuleres. While the Olympics may have provided a big boost in visibility for most partners, the same can’t be said to likeability, where the average increase was just two per cent. In other words, brands struggled to convert the higher visibility into improved perceptions. Coca-Cola’s visibility rating grew 40 per cent during the Games but its likeability rating actually slid six per cent, linked to negative press around health concerns and allegations it prompted a coffee shortage in the Olympic village. Coca-Cola’s #ThatsGold campaign – featuring a global influencer programme themed around sharing ‘golden’ memories – boosted visibility, although only 60 per cent of the campaign content had a discernible reference to the brand, the research suggests. Kate Hartman, global brand PR director for Coca-Cola, stresses the importance of focusing on shared experiences for its Olympic activities. "Judging by the level of engagement and response our influencers received from their followers — and by the level of engagement we’ve seen tracking against the #ThatsGold – our influencer program has definitely been a key win for these Games." 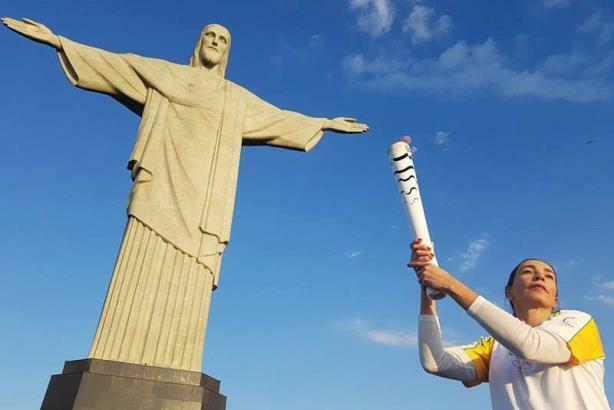 Hartman also points to the success of Coca-Cola’s Olympic Station in Rio, a "hangout location" with #ThatsGold themed events featuring athletes, music artists and influencers (including Brazilian model and actress Alessandra Ambrósio, pictured above). Visitor numbers exceeded expectations, Hartman says. Elsewhere, the Olympics enabled the less prominent sponsors to grow their visibility; Dow Chemicals’ visibility rating rose 37 per cent during the Games, for example. Others did less well. Panasonic saw a marginal decrease in visibility (-3 per cent), with the company’s activities such as the use of technology in ceremonies failing to gain traction. Procter & Gamble’s likeability rating grew seven per cent during the Games, although it had the highest likeability rating overall, with its #thankyoumum campaigns proving especially popular on social media. What of the third metric: advocacy? Intriguingly, none of the 11 sponsors generated a statistically significant growth in brand advocacy during the Games. Should this be a concern? It’s certainly a noteworthy statistic, although as long as KPIs are reached, it’s unlikely to cause sleepless nights for many brand owners. 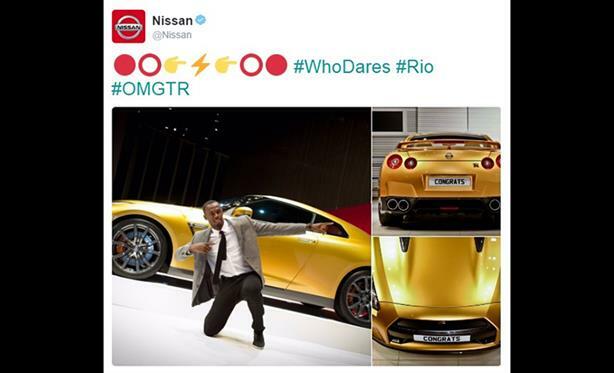 Talking of results, one brand, Nissan - not a worldwide Olympic partner but an official sponsor of the Rio games – has probably demonstrated the benefits of its activities more clearly than any. The car maker, which launched its Nissan Kicks vehicle in Brazil and Latin America to coincide with the Games, saw its activities generate more than 4,000 articles globally. Crucially, its market share in Brazil rose one percentage point to 3.5 per cent during the Olympics, with more than 2,000 registrations and down payments for Nissan Kicks. As Rio 2016 drifts into memory, it is statistics like this that will ultimately determine the real brand victors of the 'sharing Olympics'.